HCCC offers an environmentally friendly and uniquely innovative space for your events. Make your next event - be it a wedding, cultural event, social gathering or private puja ceremonies - an unforgettable experience. Temple Managers are on site and able to work with you to make your event perfect. Onsite Food service (Maha Prasadam) is also available. 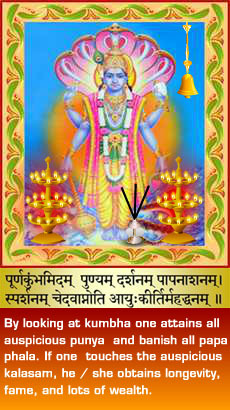 Event Halls Available for Rent Any Religious Functions, Birthdays, Weddings etc..
Vastra Samarpana Please sponsor for Vastra Samarpana as early as possible as there are only limited vastrams are available. Doctor Volunteers for Health Advisory Services - Resident doctors / Interns with their license are welcome. 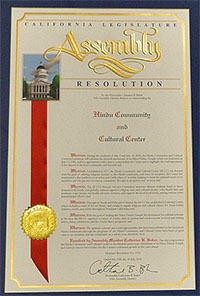 California Assembly Woman Catherine Baker was at our temple on July 9th to give away the Resolution from the California State Assembly congratulating HCCC for its 30th anniversary and for our services to the community at large. It was indeed a proud moment for HCCC! Thank you Catherine Baker! 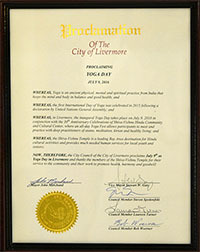 The City of Livermore declared July 9th as the Livermore Yoga day. They also presented this proclamation to the Shiva Vishnu temple on the occasion of the 30th anniversary of this institution that does yeoman service to the community. Livermore Mayor, John Marchand was present on the occasion. HCCC needs volunteers in various functional areas such as maintenance, publicity, youth and education activities, food preparation and distribution, hundi collections, etc. "When you visit the Temple, Please place your donations in Hundis only. 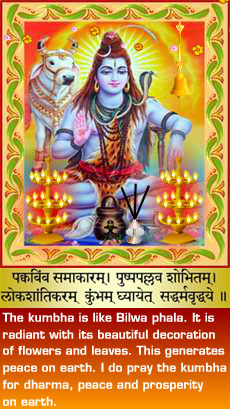 Please do not throw or place cash (bills/coins) on or near Idols, instead please put them in Hundis only"
Donate to HCCC generously to support various HCCC initiatives and to keep the traditions alive!!! !